The Nazis viewed Poles and other Slavic peoples (people from countries including Russia, for example) as inferior, and used them for forced labour. Poles who were considered ideologically dangerous (including thousands of intellectuals and Catholic priests) were targeted for execution in an operation known as AB-Aktion. Between 1939 and 1945, at least 1.5 million Polish citizens were deported to German territory for forced labour. 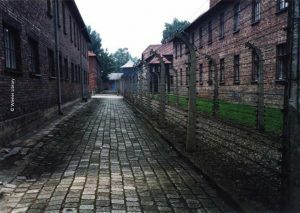 Hundreds of thousands were also imprisoned in Nazi concentration camps. It is estimated that the Nazis killed at least 1.9 million non-Jewish Polish civilians during World War Two. In the German-occupied Soviet Union, the Commissar Order (issued to the German army by the Armed Forces High Command) targeted Red Army political officers to be murdered. During the autumn and winter of 1941-1942, German military authorities and the German Security Police collaborated on a racist policy of mass murder by shooting of Soviet Prisoners of War, Jews, persons with ‘Asiatic’ features, and top political and military leaders. Around three million others were held in makeshift camps without proper shelter, food, or medicine with the deliberate intent that they die. Read the life story of Witold Pilecki, a member of the Polish resistance who was the only inmate known to be voluntarily imprisoned at Auschwitz.